Your home is a respite from the world and we believe everyone deserves a place they love coming back to at the end of the day. It should be a reflection of your own lifestyle and personality, not ours. At Pamela Neel Interiors, we work hard to make that happen for each and every client, regardless of scope. Changing the way our clients feel about their living spaces brings us great joy; we want you to love it! Our interior design concepts address the challenges our clients face and produce beautiful, functional, livable spaces. Many of our clients find they are short on time, are flooded with options, and have unanswered decorating questions, making the process feel overwhelming. At PNI, we strive to enhance and simplify the entire interior design and decorating process ultimately helping our clients save time and money and avoid costly mistakes. We believe that working with a designer should be fun and collaborative; it isn’t something that should ever feel intimidating or uncomfortable. We work with a wide variety of budgets to accommodate projects large and small. All clients are in various stages of the “design lifecycle,” which means we always have various starting points, from an interior design perspective. Some may be starting with a clean slate; others may need us to incorporate their own pieces into the design. We may be tackling many or all design elements in a single space or multiple spaces or just a few key design elements in a space. We invite you to visit our website to see a full description of our service offerings: - Full-Service Design and Decorating - Interior Design and Decorating Consulting - Materials and Finishes Consulting - Consulting Retainer Package At PNI, we don’t have a “signature style”, our goal is to guide our clients to their own style. Whether you lean toward transitional, coastal, mid-century modern, contemporary, or you’re not sure what your style is, we’ll help you achieve the look you want. Bring us your design challenges or imperfections (as some of our clients call them). Let us see what your space can be, not what it is. Just B Interiors Design Philosophy... We all want the latest and greatest design style within our environment, but does that mean sacrificing how we feel? Creating balance, finding comfort, staying organized and having peace of mind is vital for our well-being. Just B approaches design in a fresh innovative way while still being able to solve your design challenge. Our passionate mission is to work as a team to create beautifully inspired interiors that reflect our clients' unique and personal style. Showhomes NE Florida can help a home owner or Realtor in any situation get there listing ready for the market. Redesign, traditional staging, staging with home managers, and also interior remodeling and selection on upgrades/ updating for any listing. 16 years of experience. Nesting Place Interiors is located in Ponte Vedra Beach, Florida. Our passion is to create beautiful and elegant spaces that reflect each of our clients. Our desire is to create a décor that when you open the door you know you are home. A New York native, Gordon holds over twenty years experience as a designer and design business manager. He is a nationally recognized expert in lifestyle design management, directing hundreds of projects; small residential jobs to multi-million dollar projects during an eighteen year tenure with Ethan Allen Interiors. A native of Northeast Florida, Larry Johnson is member of ASID and holds an A.A. in Interior Design from Florida State College and a member of the F.S.C.J. Interior Design Advisory Board. In 2014 Gordon & Johnson completed the design merchandising for eight local builder's model homes and has established an exceptional client base seeking concierge design service. St. Johns Interior Design and Consulting | Best of Houzz 2014–2019! Lola Interiors delivers livable luxury through a simplified design process and personalized solutions; with a commitment to professionalism, excellence, and integrity, we anticipate needs and leave all things more beautiful than found. Ask about our various levels of service, from working integrally with your architect and contractor throughout the construction process to consultation services - we can accommodate projects of any size, any style, and any budget. Palm Coast Full Service Design Firm Best of Houzz 2014-2017! Making beautiful and functional spaces out of what feels like an overwhelming amount of information and choices. Relax and enjoy the process! From concept through every detail to complete your project, Abode Interiors delivers a personal environment tailored specifically for you. By interpreting an individual client’s style and needs, Abode Interiors can successfully incorporate function, current trends and budget to each project. Our goal is to provide personalized design & decorating services for your project that perfectly captures your style, meets your functional needs and your budget. From a simple rejuvenation to full remodel; small projects to big steps. From space planning to design concepts; consultations to personal shopping assistance, we are here for you. Interiors well designed is our motto. Award winning and Published Interior Designer Best of HOUZZ 2014, 2015, 2016, 2017 and 2018 "I LOVE to transform a bare, lifeless space, into a home full of heart and soul! My practice is based on my ability to feel and see through the eyes of my clients: to listen, communicate and explore the details of their needs and lifestyle prior to their individual style emerging along with the perfect custom living space." *Authorized Wellborn Cabinetry Dealer* We are a full service interior design company. Our Ponte Vedra retail showroom is open to the public and offers a large selection of upholstery, furniture, flooring, cabinetry, lighting, accessories, artwork, fabrics, wallpaper and more. We handle projects ranging from design consultations to managing full renovations. We value communication, integrity, partnership and respect. Leanne Jones Interiors is a residential interiors firm located in Atlantic Beach, Florida. Interiors have always been my passion. I have been greatly influenced by the various artists in my family, with extensive backgrounds in interior design and visual arts. By bringing creativity and knowledge to each project, I design spaces that are comfortable, functional and most importantly reflective of my client’s personality and lifestyle. I truly love what I do. Interior Design Firm with over 20 years experience, Design Loft Interiors offers the client the ability to have the capabilities and design flair of an International Designer with the talents of Commercial and Residential Interiors combined. We bring a wide portfolio of knowledge to the table, encompassing products and ideas from commercial and residential design, often crossing over with various resources, talents and design products. Our approach is to collaborate with our clients. We enhance their surroundings and lives by taking a design they envisaged and bringing it to life with our expertise and guidance every step of the process. At Lisa Gielincki Interior Design, we offer 20 years of experience in a vast range of project types from residential design including model homes to commercial spaces such as medical offices, private offices and retail spaces. We work very closely with our clients on a personal level to ensure that every project is a real expression of the client it serves. KMH design has been designing residential interiors for more than 20 years. Specializing in contemporary environments, we focus on creating personalized, modern and eclectic interiors for the way people live today. Our expertise is in establishing the overall design aesthetic for new constructions and remodels. At KMH design we understand the importance of working with the client, architect and builder, from day one, to ensure the project stays focused with open communication between every party. The ultimate goal at KMH is to present our clients with a design package that is an expressive and unique reflection of their original vision. A good home design professional will hone your style down to its very essence and be able to choose a functional layout that feels natural to you. Interior design companies can be involved as much or as little as the client desires. 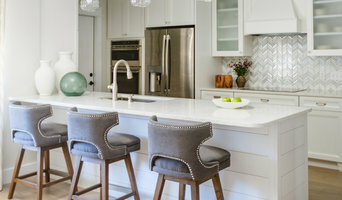 Many clients who hire an interior decorator in Atlantic Beach, FL — particularly those who are remodeling — have a good sense of how the room should look and what products they should use. Often clients will insist that interior decorators use the products already present in the house. Other times a designer will need to start from scratch — especially if this is a newly purchased or just-built home. An interior design company will need to figure out exactly what the client needs, which includes organizing rooms, picking flooring and wall colors, and finding furniture to complement it all. Sometimes that means he or she will have to recruit help from other Atlantic Beach, FL home professionals to help create the perfect look for your renovation. Here are some related professionals and vendors to complement the work of interior designers & decorators: Architects & Building Designers, General Contractors, Home Builders, Design-Build Firms, Photographers. Do your research before meeting with an interior designer or home decorator in Atlantic Beach, FL. Ask yourself what you want your space to become and what it will be used for. Figure out the extent of what you need help with, what your must-haves are and what your budget is. Interior design services can add up fast, so be up front with a potential design firm or individual from the beginning. Also, pick an interior decorator that fits your style. Browse through the portfolios of different Atlantic Beach interior design firms and decide if you would live in those houses. Just because you like something doesn’t mean you could live in it. There's a big difference! Can I see your design portfolio? When will the home renovation be done? Do you charge an hourly rate or a flat rate, or use the cost-plus method or a mixed method? Find an interior designer or home decorator in Atlantic Beach, FL on Houzz. Narrow your search in the Professionals section to find Atlantic Beach interior designers near you. You can also look through Atlantic Beach, FL photos to find a room you like, then contact the design firm who designed it.